River Valley junior Seth McDonald delivers a pitch during the Raiders’ 9-3 victory over South Gallia on Friday night in Bidwell, Ohio. BIDWELL, Ohio — Three was the magic number, as the Raiders tripled-up on the Rebels. 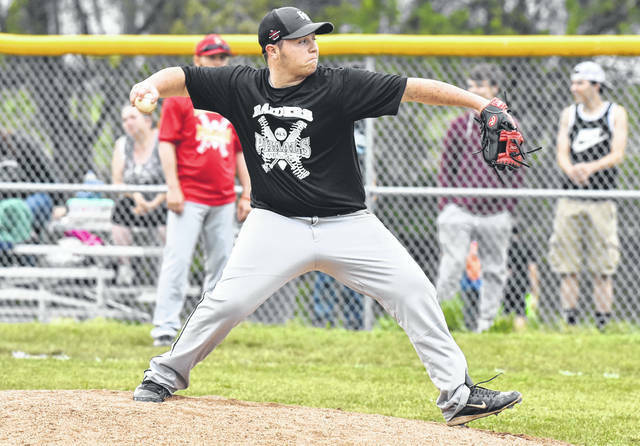 The River Valley baseball team held visiting South Gallia to three hits, as the Raiders earned a 9-3 victory on Friday night in Gallia County. The Raiders took a 1-0 lead in the second, as they manufactured one run on two hits and one walk in the inning. The Silver and Black tacked on four additional runs in the third, as Jack Farley, Chase Kemper, Andrew Mershon and Chase Barber each scored in the inning to extend the lead to 5-0. RVHS added a run in the fourth, as K.C. doubled to start the frame and later scored on a hit by Joel Horner to further the advantage to 6-0. River Valley plated a run in the fifth, as Kemper scored his third run of the contest to extend the lead to 7-0. 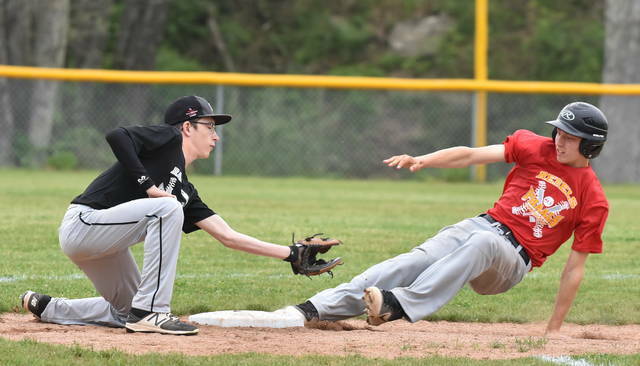 South Gallia narrowed the deficit to 7-1 in the top of the sixth, when Jeffery Sheets reached on a two-out triple and scored on a single by Wade Luther. The Silver and Black countered in the bottom of the sixth, as Farley and Chase Caldwell each provided runs to extend the lead to 9-1. The Rebels added two runs in the seventh, when Timothy Murphy and Austin Stapleton scored to narrow the deficit to 9-3. RVHS however allowed no further runs in the finale as they closed out the six-run victory. River Valley collected 11 hits and stole a total of eight bases in the contest. Farley and Mershon each finished with two safeties apiece, respectively, to lead the way for the hosts. Harner, Kemper, Collins, Caldwell, Barber, Seth McDonald and Wyatt Halfhill each provided on hit apiece. 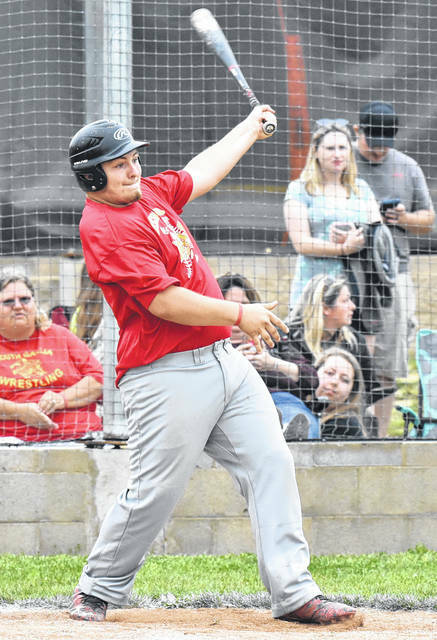 On the offensive side for South Gallia, Sheets, Luther and Jared Burdette each finished with one hit apiece, respectively. The Rebels left a total of eight runs on base, while RVHS stranded six. The game served as the final home contest for River Valley seniors Evan Justus, Will Edgar, Jack Farley, K.C. Collins and Zach Stein. Following the game RVHS coach Bobby Jeffers spoke candidly of his senior players. 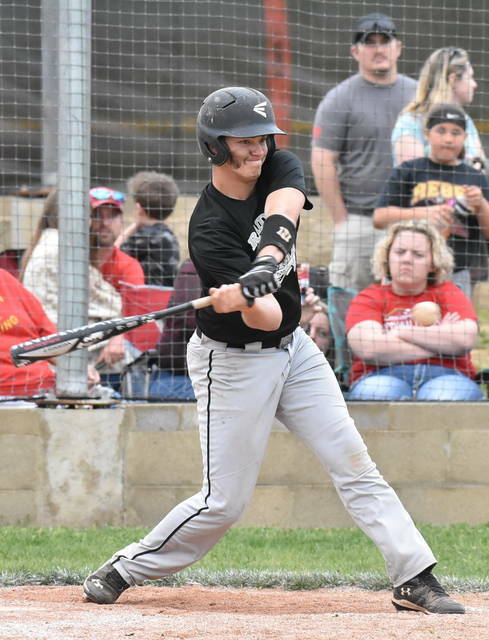 Jeffers also elaborated on the potential momentum the victory provided for the upcoming postseason, as River Valley is set to meet fourth-seeded Crooksville in the 2018 OHSAA D-3 Southeast District for a sectional semifinal at 5 p.m. Wednesday, May 9. The contest also marked the final regular season game for SGHS seniors Wade Luther, Troy Watson, Curtis Haner, Austin Stapleton, Brandon Rutt and Tyler Bryan. SGHS coach Matt Bess discussed the impact of his senior players — particularly their importance of the growth of the program. “Stapleton, Luther and Bryan have been with me since I started coaching here,” said Bess. “They are a big part of what we’ve been trying to build here. They are a big part of some of the successes we’ve had here. Despite not having that success this season, the seniors on this team have helped to build a foundation that hopefully we can continue to grow. SGHS traveled to face sixth-seeded Trimble for a D-4 sectional semifinal contest on Saturday.